This September there have been a couple of sightings of my old vegetable garden in San Leandro. 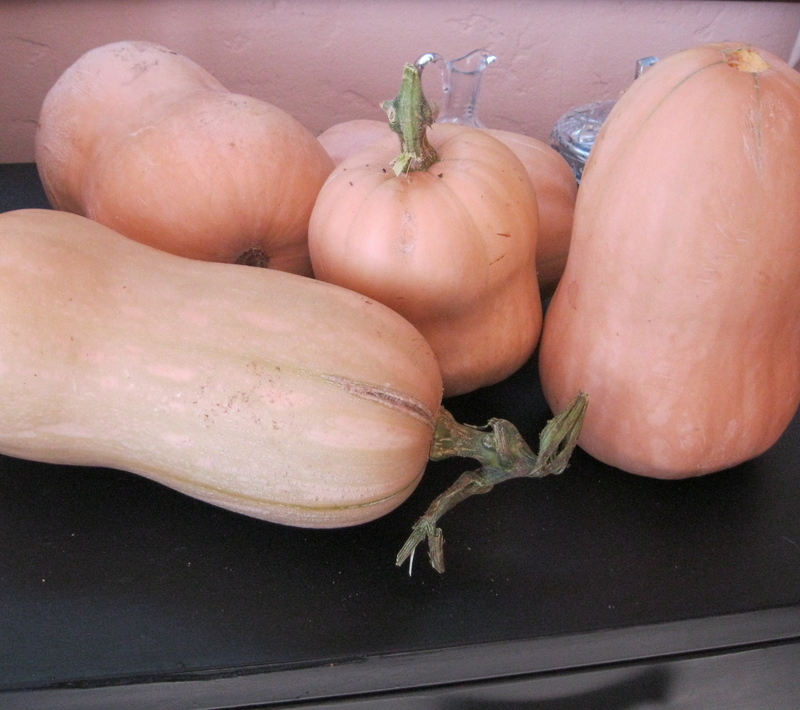 First I heard that butternut squash had taken over the entire yard. I asked about the beans, but my informant hadn’t seen any beans. Then I got an email from someone else, explaining that my garden had fed her all summer, that she had eaten green beans and tomatoes and butternut squash and given beans and squash away to neighbors of hers. I am happy that people were able to eat the produce I grew since I could not eat it myself. I still longed for some of those butternut squash and put in a call to my former landlord to ask if I could pick some squash (Johnny is away for the time being). Meanwhile in my new container garden here in foggy Kensington one of the poblano pepper plants has finally fruited and a single principe borghese tomato is slowly turning red in the sunny days of September. The other tomato plants are full of pale pink and green Amish paste tomatoes and more borgheses and a mystery tomato from my sister-in-law’s Vallejo garden, currently a two-tone green job. 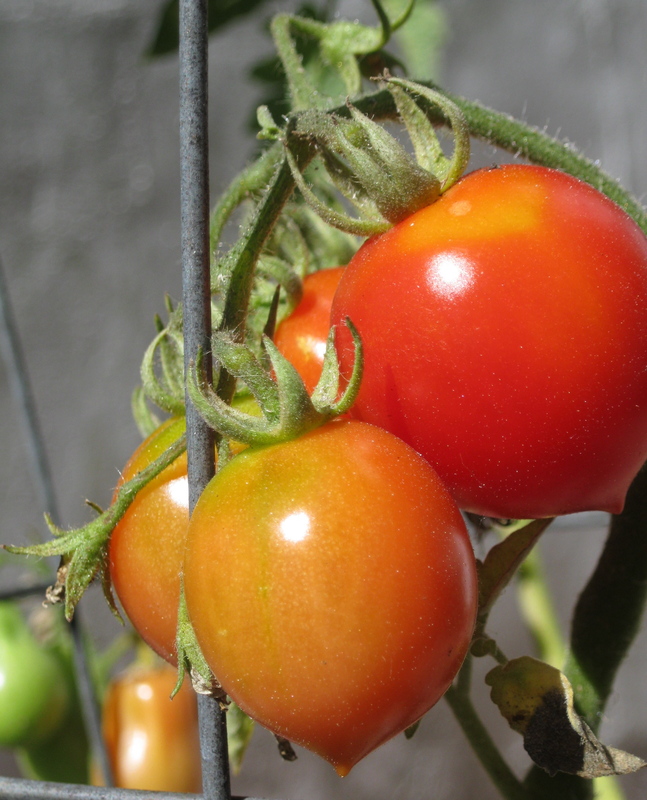 Will the tomatoes ripen before the plants die? Before it rains? Will I bring the green tomatoes inside to ripen? Will I make a green tomato chutney? Stay tuned for the October tomato and pepper report. The landlord called back. He said, “I know who planted that garden” and granted me access to pick produce there. When my friend M. and I drove out we found the wildest of gardens: all of the hard surfaces had been obscured by foliage. Squash vines snaked everywhere: from where I had planted them along the back fence line they had crossed the entire yard and begun to climb up the back stair. All paths and spaces between rows had vanished and I had to step carefully through unripe squash to remove ripe squash from the vines that also bore squash blossoms, tiny green squash and full-sized green squash. Buried beneath green leaves ripe principe borghese tomatoes crept along the ground close to the house while ripe Sun Gold cherry tomatoes lurked in the understory and green ones grew through the side fence. Some of the weeds I had worked to eradicate found new openings where the green beans had been. I cut the three small heads of purple cabbage that I had planted in February, but left chard and kale growing by the back fence. I did not find any Amish paste tomatoes or basil or pepper plants in the tangle, but I could not reach large portions of the yard in the amount of time I had. I did find some dried bean and pea pods, picked what I could and shelled about half a cup of mixed black-eyed peas and pinto beans while I waited on the BART platform to go home. M. hauled most of the butternut squash we picked in the trunk of her car, but I carried a token specimen in my backpack. along with a Tupperware container of tomatoes and the shelling beans. As I write this, I am roasting principe borghese tomatoes in the oven with olive oil and a little garden mint*. Pinto beans and black-eyed peas are soaking together in a big pot. Small slices of peeled butternut squash share the oven with the tomatoes. I propose to make a soup to honor my gardens, here and there, the honorable labor I did, the lovely San Leandro sun and fertile soil, the strong heirloom seeds that survived my inexpert care and the lack of rain, the compost of coffee grounds, egg shells, tea bags and the occasional chicken head. 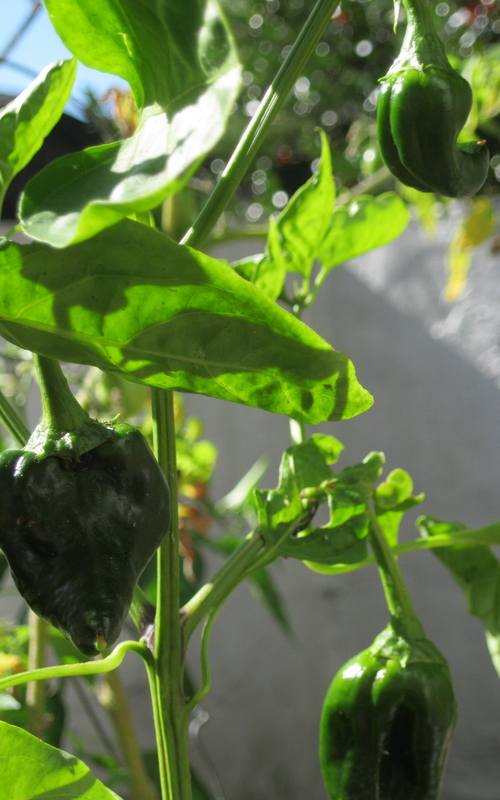 I will flavor the soup with chiles to honor the poblano plant and its late-borne fruit. The local library has recently yielded up treasures, including The Art of Practicing: A Guide to Making Music from the Heart and The Heart of Zen: Enlightenment, Emotional Maturity, and What It Really Takes for Spiritual Liberation. I read them and write about them and work at becoming aware of my habits and my reactive emotional patterns, watering my life with sitting meditation and compassion meditation in the hope of bearing sweeter fruits from new seeds while extracting learning from the old bitter ones. I begin to advertise writing practice classes again — perhaps this time I will find more students. I continue to practice music and to busk in the BART station and Farmers’ Market, practicing gratitude and patience, saying with Leonard Cohen each day, “And even though it all went wrong, I’ll stand before The Lord of Song with nothing on my tongue but ‘Hallelujah. '” I wish you all a fine fall. * This is the first year I have raised this variety: they are very pretty, about the size of cherry peppers, but I don’t especially care for their flavor, either eaten raw or oven roasted — they are not sweet enough to suit me, but they are a drying tomato so I will dry some and report back about that next month. It may be that I just have not discovered their secret(s). I had wanted a paste tomato, a drying tomato and tomatoes to eat raw and chose accordingly from recommended heirlooms. Plus, I had to have the Sun Gold hybrid cherry, the most delicious tomato I have ever tasted (Those I grow every year).